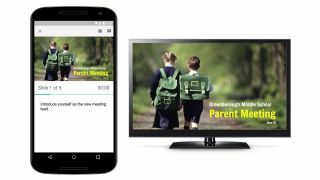 It isn't proving to be the best week for Google (with the demise of its faltering social network Google+ due to a catastrophic data breach), but it's not all bad - the company has just announced the addition of live captions for presentation app Google Slides. Speak into your microphone while presenting a slideshow and Google Slides will transcribe your words into captions in real time. It's an addition that'll be welcomed by anyone presenting to a group who might not all have headphones or speakers handy. Live captions are currently only available if you're using Chrome. To use it, click the 'CC' button in Sheets, or tap either Ctrl+Shift+C or Command+Shift+C (depending on whether you're using a PC or Mac respectively). The live captions almost certainly use the same speech recognition technology that YouTube uses to produce automatic closed captions for uploaded videos. Microsoft uses its Translator Live feature to perform the same task in PowerPoint. PowerPoint can transcribe speech in 60 languages whereas Google Sheets can only manage US English, but we anticipate it will also become multilingual before long.